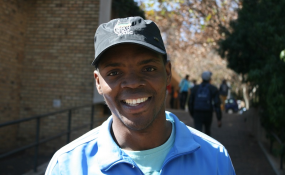 Former student leader and #FeesMustFall activist Mcebo Dlamini claims the State has no case against him and has accused it of deliberately employing delaying tactics. Dlamini faces charges of theft, intent to cause grievous bodily harm, public violence, possession of a dangerous weapon, malicious damage to property and being in the country illegally. Addressing the media outside the Johannesburg Magistrate's Court after his appearance on Friday, he accused the State of finding a way to delay his case every time he appears in court. "I am not intimidated and not deterred. Instead, I gather strength every time they do this. The support we are receiving from young people and other formations, like the bikers, are some of the things that say we are touching nerves and lives and it keeps us going," he said. "I am very strong, strong as a buffalo bull." After his walk to the Union Buildings, he proposed a number of remedies, such as a truth and reconciliation commission, and mediation. He said the prosecution did not give him reasons to explain why they would not participate in mediation. Dlamini added he had been charged under apartheid laws but that, as the youth, they would change those laws. "These people, they don't have a case against me and are abusing State machinery. Instead of prosecuting fake pastors and prophets who are molesting women left, right and centre, and people who are killing women in the townships and everywhere else, they are using State machinery and State resources to prosecute and push a political vendetta," he said. Regarding his nomination to become the ANC Youth League (ANCYL) president, Dlamini said politics was a calling. "What drives us is black consciousness and the love of the masses of our people. What keeps us going is what our parents taught us and how we were born. We were born by freedom fighters, by people who picked up arms and went to exile to fight a system. We are here to finish what our parents started." He said he remained true to the cause. "Ambitions, I don't have ambitions. But I am ready to be sent by young people. Should the youth feel that I possess everything that they need and say: 'Mcebo, can you go and compete?' I will say yes without any hesitation, to restore the dignity of a black child," he said. He lashed out at his critics, who said the ANCYL was dead and irrelevant. Instead, Dlamini said the organisation needed new dynamism and fresh minds. His trial was postponed to April 9, 2019.